Bahrain’s Salwa Eid Nasser has shined at the Oslo Bislett Games in Norway, held recently here as part of the International Association of Athletics Federations (IAAF) Diamond League. 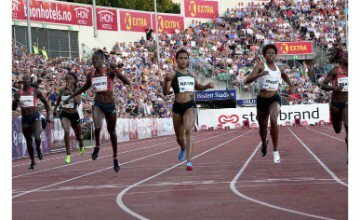 Salwa powered to a brilliant victory in the women’s 400 metres to maintain her impressive form in leading global competitions. The win was her second in a row in a Diamond League event, as she had just last week also claimed first place in the 400m at the Golden Gala in Rome. Salwa headed into her race as one of the favorites following her Italian success. The former World youth champion secured her win after completing the race distance in 49.98 seconds, the only athlete in the event to go under 50s. Phyllis Francis of the US claimed second place in 50.47s, while Shakima Wimbley, also of the US, finished third in 50.53s. Bahrain’s Sadik Mikhou, Winfred Mutile Yavi and Mohammed Ayoub Tiouali also participated in the event. Mikhou just missed out on a win and had to settle for the runner-up spot in the men’s mile. Winfred had a solid showing in the women’s 3,000 metres steeplechase, while Tiouali had a respectable 11th place result in the men’s 1,500m. Bahrain Athletics Association (BAA)’s Deputy President, Mohammed Abdullatif bin Jalal, extended sincere congratulations to the Supreme Council for Youth and Sport’s First Deputy Chairman, West Asian Athletics Association President, HH Shaikh Khalid bin Hamad Al Khalifa, on Salwa Eid’s win at Oslo Diamond League 400 m race. Bin Jalal expressed pride in the Salwa Eid’s victories during the recent Diamond League events, and praised the results of Sadik Mikhou, and wishing them further success in the upcoming competitions.